Mars InSight project manager Tom Hoffman of Nasa's Jet Propulsion Laboratory says he's "completely excited and completely nervous at the same time" about Monday's planned touchdown of the Mars InSight spacecraft. TAMPA • A spacecraft that cost nearly a billion dollars is on course to make a perilous landing on Mars today US time, if it can survive a high-speed approach and the scorching heat of entering the Red Planet's atmosphere, a process Nasa has nicknamed "six and a half minutes of terror". "There is very little room for things to go wrong," said Mr Rob Grover, head of the entry, descent and landing team at the US National Aeronautics and Space Administration's (Nasa) Jet Propulsion Laboratory in Pasadena, California. If successful, the entry, descent and landing of the Mars InSight - designed to be the first mission to listen to the interior of another planet and reveal how rocky planets are formed - will add another success to Nasa's record when it comes to sending spacecraft to Mars. So far, the United States is the only nation to have made it there, and only Nasa's unmanned Curiosity robotic rover is still tooling around on the surface. But if it fails, it certainly will not be the first. There will not be any live video streaming of Mars InSight's approach, and signals will be transmitted back to Earth on an eight-minute delay. Nor can mission managers intervene if anything goes awry. The entire landing sequence is all pre-programmed into the on-board flight computer. 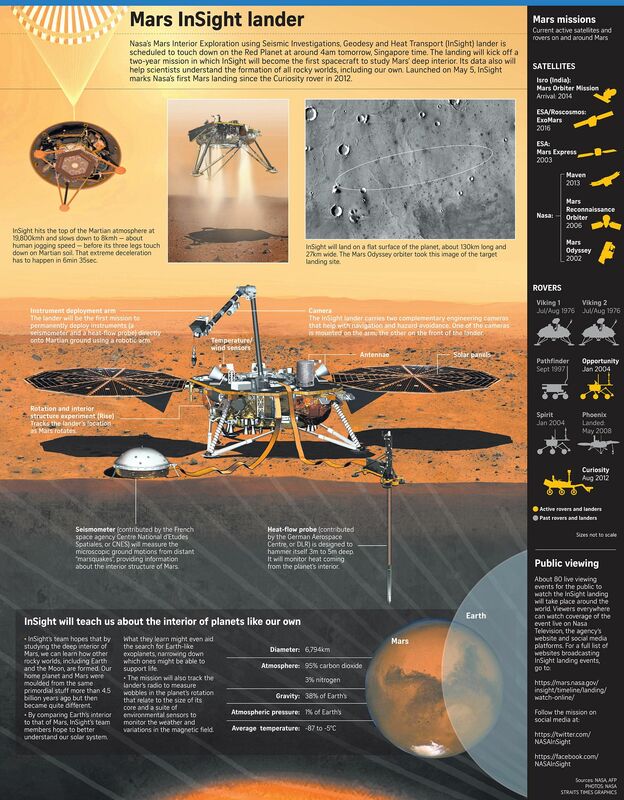 At 1940 GMT, the spacecraft is expected to separate from the cruise stage that carried it to Mars. A minute later, the spacecraft will make a turn to orient itself for atmospheric entry. Touchdown is expected at 1954 GMT (3.54am tomorrow, Singapore time). The first "beep" from the spacecraft's X-band radio - indicating whether InSight survived the landing - is scheduled for 2001 GMT. The first image from the surface of Mars is expected at 2004 GMT. However, it is possible this image may not arrive until much later than that.